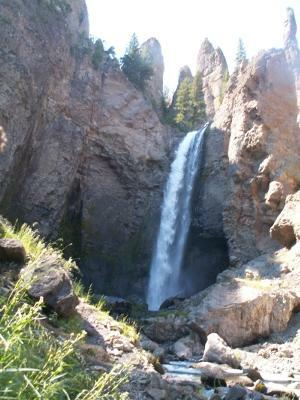 As by Aug 2008, the trail to the base of Tower Falls hasn’t reopened yet. But it is possible to get there, either by climbing the barrier onto the trail (some people do, despite the signs) or getting down to the creek and hiking upstream. It requires climbing a few large boulders though. On the trail there are some washouts, but when dry they are passable with some careful maneuvering. Better not to try it when its wet or icy and slippery.